The Arroyo Willow – Salix lasiolepis – is a native shrub or tree in California and in most Western states. The species is known as a freshwater indicator. As much as the Arroyo Willow likes water, it is also drought tolerant. Along with plant and animal habitat, the Arroyo Willow is used as a natural form of erosion control. Native Californians and herbalists use the bark and leaves to treat headaches, sore throats, and diarrhea. 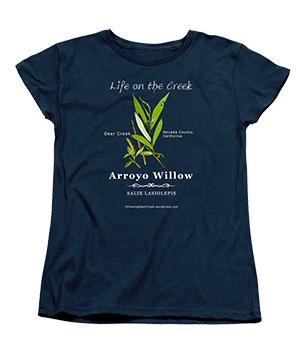 The Arroyo Willow is used to make baskets, arrows, furniture, and flutes. The willow grows long, straight shoots in the spring. These shoots are highly flexible and resist breakage. It symbolizes grief – (bending) and recovery – (bouncing back).